Today, I was thinking to write about errors, overruns, collisions, etc that we could have in network interfaces which are a mess for network engineers and, most times, these issues are difficult to resolve without a good troubleshooting process. However, this weekend has been a little bit interesting because we have seen how big companies like Telefonica, and many others, has been hit by Ransomware and it has been published to the media. Therefore, I must write about this issue. First, I think it has been another spam and malware campaign, just another, but this time, many Spanish companies have been affected, which some of them are from the stock market IBEX35, and this has been the reason why the media has been speaking about cyberattacks. However, it's a pity that big companies like Telefonica hadn't applied the patch on time. Maybe, they didn't have enough time to test the patch MS17-010 published by Microsoft and they would rather take the risk to be infected. Unfortunately, this time, their internal desktops were compromised. We are always speaking that small companies doesn't have enough resources to fight against cyberattacks but we can also see that big companies, with lots of resources, have the same issues but on a large scale. Meantime, we have seen how shares were without any lost, which means investors don't mind this kind of news. There are many Microsoft products affected in these cyberattacks like IE10, IE11, Edge, Microsoft .NET Framework, Adobe Flash Player, etc, etc and most of them are installed by default in most of the Microsoft Windows Operating Systems. Limit the user connection to Internet and mail while your are applying patches and upgrading systems. Upgrade signatures of your security systems like AntiSpam, IDS/IPS and Antivirus. Apply security policies to Internet access with IPS and Antivirus profiles. Install security monitoring sensors to analyse traffic on the wild. Apply patches to fix the bugs published by Microsoft to desktops and servers. Make sure you have backups. We can disable file execution with .WNCRY extension by GPO. Isolate UDP 137/138 and TCP 139/445 communication inside the network. Disable macros and scripts to mail received. We can use Office Viewer instead of Microsoft Office to open attachments. 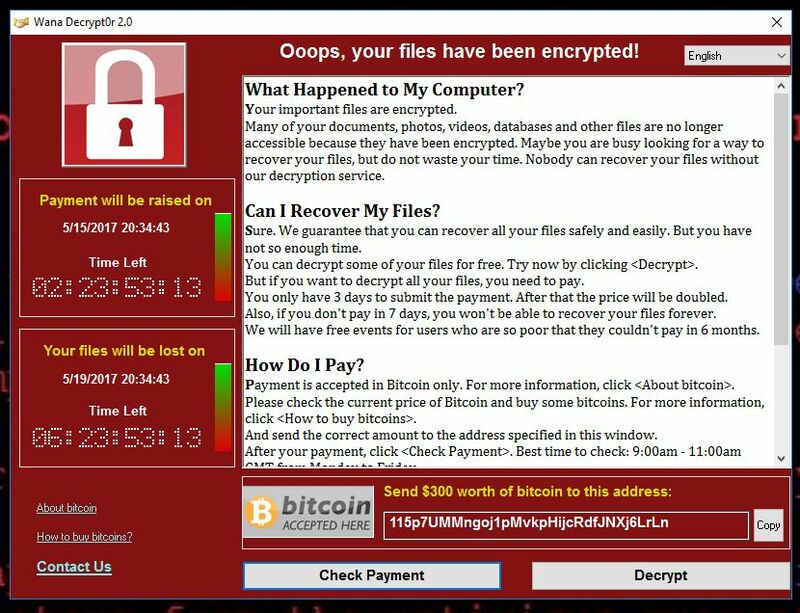 If we have done the homework, we shouldn't be worried about this Ransomware anymore. Why? Because most security systems have already published signatures to block and detect this malware like, for instance, Fortinet or OTX from Alienvault. 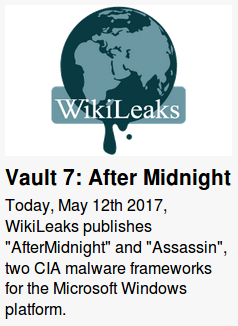 Many people are wondering about why last Friday was the day when these vulnerabilities were exploited massively. Maybe, because last Friday was when WikiLeaks published “After Midnight” and “Assasin”, two CIA malware frameworks for the Microsoft platform and, maybe, the attackers have taken advantages of these frameworks to develop this new malware. Regards my friends, pay attention, protect your assets and keep calm! !